Interaction by the public with the silver is my main aim, and I use storytelling, movement, function and a feeling of fun in my designs, to tempt the onlooker to engage with a piece and pick it up. My experience as Artist in Residence at Edinburgh Zoo has informed my recent collection- a series of kinetic silver objects, with function and form inspired by the essence of animals and birds. 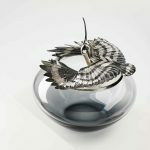 The work also explores the combination of glass and contemporary chased silver, creating functional silverware with a twist. Chasing and repousse is my main technique. How to contact Bryony Knox.